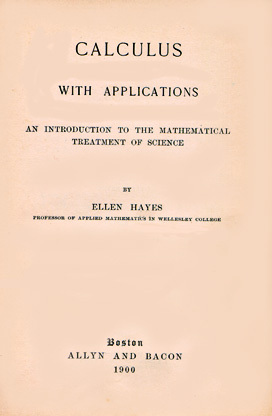 This little book has been written for two classes of persons: those who wish, for purposes of culture, to know, in as simple and direct a way as possible, what the calculus is and what it is for; and students primarily engaged in work in chemistry, astronomy, economics, etc., who have not time or inclination to take long courses in mathematics, yet who would like "to know how to use a tool as fine as the calculus." The "pure" mathematician will note the omission of various subjects that are important from his point of view; but for him there are admirable and lengthy treatises on pure calculus. Also the student whose experience has led him to conceive of mathematical study as the doing of interminable lists of exercises, will be surprised and, possible, disappointed. This book is a reading lesson in applied mathematics. Fancy exercises have been avoided. The examples are, for the most part, real problems from mechanics and astronomy. This plan has been pursued in the conviction that such problems are just as good as make-believe ones for purposes of discipline, and a good deal better for purposes of knowledge. The time-honored method of presenting calculus is much as if travelers should be stopped and made to pound stone on the highway, so that they never get anywhere or even know what the road is for. The following pages are a protest against the conventional method; for I am wholly in sympathy with a remark made by Professor Lester F. Ward, in his Outlines of Sociology: "There is no more vicious educational practice, and scarcely any more common one, than that of keeping the student in the dark as to the end and purpose of his work. It breeds indifference, discouragement, and despair." A chapter on analytic geometry has been introduced, in the hope that teachers will try the plan of presenting the elements of the calculus and of analytic geometry together. There is no good reason either for keeping them distinct or for presenting analytic geometry first. To three works I have to express my deep obligation. The spirt manifest in them as been my chief encouragement in preparing this book. I refer to Greenhill's Differential and integral Calculus, Perry's Calculus for Engineers, and Nernst and Schönflies' Einführung in die mathematische Behandlung der naturwissenschaften. We have in these works, let us hope, an indication of the role which calculus is to play in schemes for liberal and scientific education in the not far distant future. Geometric meaning of dy/dx. Exercises.